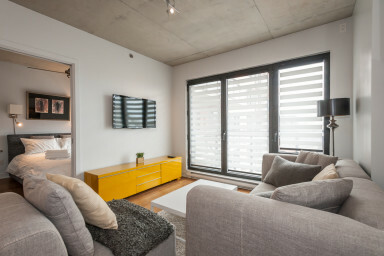 With modern design and all the comforts, this fully-furnished condo at Lowney offers a unique layout that maximises living space and is ideal for your next stay in Montreal. The open-concept main area features a contemporary aesthetic, composed of a linear kitchen fully-equipped with high-end appliances, dishware and cooking utensils, and a central 4-person dining table that makes it easy to enjoy home-cooked meals. An inviting den area, complete with comfy sofas and flat-screen TV, opens onto a private balcony overlooking the beautifully landscaped interior gardens, and also included, is a sleek office space with linear desk and work chair. One closed bedroom holds a queen-size bed along with a large walk-in closet. Enjoy spa-like finish in the designer bathroom with ceramic tiling and soaker tub, and this unit also offers a stackable washer/dryer for added convenience. Simplissimmo provides everything you need to live like a local! Boasting over 1,000 units spread over eleven phases, Lowney is one of Montreal’s most impressive developments. It’s stylish and modern construction pays tribute to the area’s industrial character while offering the best in urban luxury. Connected by suspended walkways, the phases form a network, giving residents access to numerous amenities and services. Take advantage of the Urban Chalet for a spacious common lounge with fireplace, kitchen, and games and recreation centre, or enjoy the panoramic rooftop terraces with barbecue and seating areas, outdoor swimming pools and Jacuzzis available through Spring and Summer. Stay fit in the fully-equipped, state-of-the-art fitness center. Lowney also offers a conference center that can be rented out for corporate events and indoor parking is available. Ideally located between the downtown core, the International District and the Lachine Canal, and serviced by the Bonaventure metro station with direct access to major expressways, Griffintown has become one of Montreal’s most sought after addresses. With no shortage of nearby conveniences and services, this area is home to a growing number of trendy restaurants, pubs and cafés located along Notre-Dame Street, the scenic bike paths of the nearby Lachine Canal and the Peel Basin offer a little escape from the hustle and bustle of the city, and staying in Griffintown also puts you in close proximity to the Bell Center for Montreal Canadiens games or any number of world-famous concerts. Add to that, the effervescent Old Port is just minutes away, and Griffintown really does put you in the heart of it all! Simplissimmo will happily welcome tenants to the apartment on the day of arrival! Check-in is usually after 3PM. Simplissimmo meets with tenants on the day of departure to collect keys, verify the state of the unit, and bid a fond farewell so you never have to worry. Check-out is usually at 12PM. In the heart of the city! Being in the center of the action is as simple as picking a neighborhood! Downtown, Plateau, International District or Old-Montreal, the city has it all. All units under Simplissimmo's management should offer fully-equipped kitchens complete with ultra-modern appliances, perfect for the gourmet chef! Properties under Simplissimmo's management are mostly furnished with memory foam mattresses that adapt to body's natural shape and temperature, for the comfort of the tenants! All properties under Simplissimmo's management should provide full sets of high-quality cotton bed & bath linens. Let us know if you accept pets in your unit. Service Simplissimmo Inc. specializes in furnished property management and works closely with the HP & Associés real estate agency. HP & Associés exclusively handles the rental process for all properties managed by Simplissimmo.